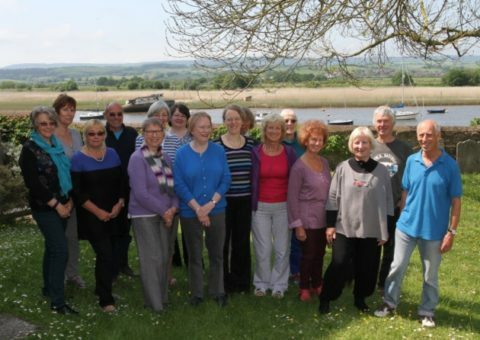 The Quay Note Singers (formerly known as Singing For Fun) are led by Sarah Pennington, and it’s a friendly choir for anyone who thinks they might enjoy singing in harmony with others. No previous experience or skill is required, you are not expected to read music, instead we learn songs by ear and in no time at all we can be making beautiful music together! We sing all kinds of music, and we have some fun too! And we can be persuaded to sing in public occasionally. No commitment necessary, you can come along any time. The cost is: £6 (full) / £4 (low income) per session; or £30 (full) / £20 (low income) for a 6-week block. Contact Sarah for term dates. Follow this link to see a video clip of us, courtesy of the local paper! “I just wanted you to know that STUFF happens in everyone’s lives and for 2 hours every week we are able to immerse ourselves in your world. You somehow lead us through a world of songs and, even if we forget our brains during the 2 hours you lead us, the sound is incredible!